With the election of Frank D. Scott, Jr., as Little Rock’s next mayor, there have been questions about the ages of Little Rock’s past mayors. Mayor-elect Scott will become Little Rock’s 73rd mayor when he takes office on January 1, 2019.. There have been sixty-six other men and women serve as mayor of Little Rock. Much like Grover Cleveland is counted twice in the list of US presidents because of serving non-sequential terms, there have been six men who have served non-sequential terms as Little Rock’s mayor and are therefore counted twice. Of the seventy-three mayors of Little Rock (including Mayor-elect Scott), the ages are known of fifty-eight at the the time they took office. Of those fifty eight, the youngest mayor of Little Rock was Eli Colby. He took office in 1843 at the age of 28. The next youngest is Pat L. Robinson who took office a month after turning 29. The oldest person to take office as mayor was 66 year old Haco Boyd in 1969. The next oldest was 64 year old David Fulton in 1835. The average age upon taking office is 45. The largest gap of years between the ages of sequential mayors at the start of their terms was 31 years. Webster Hubbell was 31 when he took office in 1979. He was succeeded by 62 year old Charles Bussey in 1981. The shortest gap of ages of sequential mayors at the start of their terms was roughly one year. W.W. Stevenson and Elijah A. More (yes he spelled his name with only one “O”). In 1833, Stevenson took office at the age of 35. The next year, More took office at the age of 34. Stevenson’s birthday was on January 29 and More’s was on January 20. On December 30, 1838, future Little Rock Mayor Jefferson George Botsford was born in Port Huron, Michigan. He married Charlotte Adelia Henry on June 13, 1867. She had been born in Massachusetts, but moved to Little Rock with her parents and grandparents. The couple had seven children: Nellie, Charlotte, Harriett, James, Edward, George and Charles. Nellie, James and Charles died in childhood. Botsford had served in the Union Army and fought in frontier battles against Indians. Among his commercial involvements in Little Rock were serving as mail contractor between Little Rock and Baton Rouge, proprietor of Anthony House, organizer of Merchants National Bank and president of the White River Valley & Texas Railroad. In 1868, Botsford was elected to the Little Rock City Council. The City Council suspended Mayor A. K. Hartman in February 1870. Elected in 1869, he was disliked by the aldermen, the press and a portion of the public. A court order overturned the suspension in June 1870. In January 1871, Mayor Hartman was again suspended by the Council. This time, Botsford was declared Mayor. However Hartman also still claimed the title of Mayor through the remainder of his term in November 1871. After stepping down as Mayor with the election of Robert Catterson in November 1871, Botsford returned to private life. 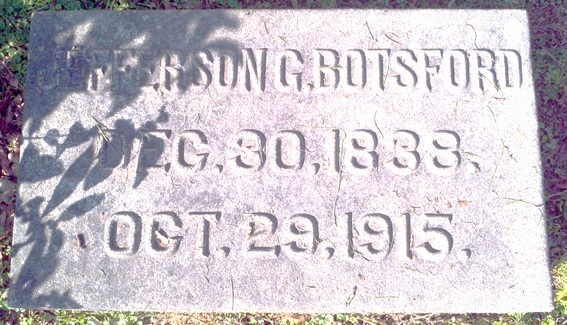 He died on October 29, 1915 and is buried at Mount Holly Cemetery.